Creating a human rights culture in Scotland is challenging in the current environment, but that doesn't mean we shouldn't be doing more to embed them in public service delivery. I was speaking at the Human Rights Consortium Scotland (HRCS) conference in Glasgow today, 'Delivering Human Rights - A Constitution for Scotland?'. My contribution was on the culture of human rights in Scotland. Sadly, the short answer to the question posed is that we don't have an embedded human rights culture in Scotland. Most of the organisations our members work in have statutory responsibilities under the legislation, but most staff would have only a vague understanding of what this means. This understanding is stronger in professions like police, social work and nursing - but limited elsewhere. As the work of the HMRC has shown, this reflects a wider ambivalence and misunderstanding amongst the wider public. Daft media coverage doesn't help as evidenced in the 2012 study by the University of Glasgow. Specific measures, awareness and capacity building are not widespread and in a recent consultation few members were aware of recent initiatives such as the SHRC National Action Plan on human rights. Our experience of impact assessments is that they have too often become tick box exercises, completed after the key decisions have been made. For example, there is some mitigation of the impact of cuts on disadvantaged groups, but limited measurement of outcomes. This also requires better training for staff and decision makers. Another idea considered by the HMRC is that every public service worker should be required to take a human rights oath, modelled on the Scottish police constable oath. The primary aim was to provoke a debate on how we might embed a human rights culture. It certainly achieved that, but our members had some concerns. The logistics of swearing in 500,000 plus staff would be significant, including the time and cost to brief staff at a time when resources are stretched to breaking point. It would also need to include others in the private & voluntary sector who deliver public services. We would also be concerned about double or even triple jeopardy in disciplinary proceedings, with employers passing the buck for their own responsibilities to the workforce. These concerns reflect the fact that the biggest barrier to human rights in Scotland is the cuts in public spending. With 50,000 jobs cut and many more to come, together with £6bn to be slashed from the Scottish Budget, human rights are coming under pressure like never before. 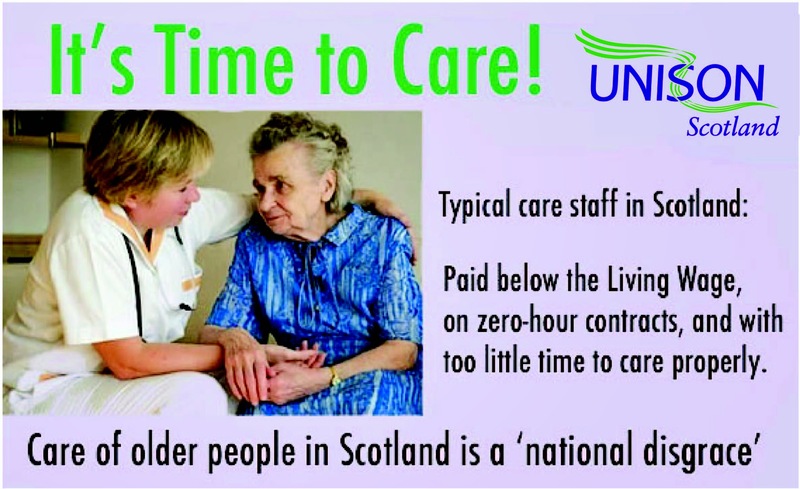 UNISON's 'Time to Care' report into social care is a good example of how the human rights of service users and staff are being ignored in large parts of Scotland. Welfare cuts are another obvious example of how human rights are being sidelined. The good news is that human rights is less of a political football in Scotland, avoiding the Tory ministers attacks at Westminster that portray human rights as an alien culture. The Deputy FM Nicola Sturgeon addressed today's conference and pointed to the Scottish Government's draft interim constitution that embeds human rights. While others would argue for a different constitutional approach, there is less difference over the principles. However, if we vote for independence in September, there will be a real debate about how interventionist the constitution should be on issues like human rights, as against a limited description of constitutional authority such as the USA. Constitutions are fine, but as delegates at today's conference raised, there needs to be education, capacity building and effective legal remedies given the social class and attitudes of our judges. If we look at the use of judicial review in Scotland, it's rarely used outside of immigration and commercial planning challenges. Even when a case does get to the Scottish courts, 75% are unsuccessful. 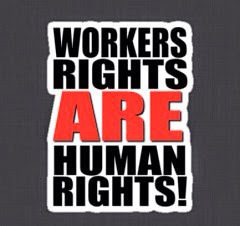 For trade unionists human rights is at the core of what we stand for. Employment rights are very limited in the UK and charges for ET applications are removing access to justice. As a senior trade union official I am painfully aware that however robust my organising, bargaining and campaigning may be, I can go home at night in safety. There are many comrades across the world who don't operate in a human rights environment and have lost their lives doing what I do ever day. That is why we should view human rights as of international importance and not be sucked into the isolationist approach of a UK Bill of Rights. Human rights are not an optional add on, it should be at the core of what we do. We need to do more to build awareness and develop practical measures to embed human rights in our decision making processes. Austerity affects everyone in Scotland, but it’s the most vulnerable who are hardest hit, as services are cut back, jobs go, pay is cut and living standards fall. Today, UNISON Scotland has published a report, ‘The Cuts Don’t Work: The impact of ‘austerity’ cuts on Scotland’s public services’ – showing what’s really happening to public services across the country. The report highlights that Scotland’s budget is being slashed by more than £6 billion in real terms. Around 50,000 public sector jobs have already gone with a further 60,000 expected jobs expected to go over the next 5 years. And local authorities have little choice but to put up charges for services like school meals, burials and cremations, day care and home care rates as they attempt to balance the books as a result of the ongoing council tax freeze. As you would expect, there is plenty of analysis of the numbers, although we have illustrated these using charts and info graphics. In addition, we use our members’ experiences of the impact of cuts – telling their own stories in their own words. This report shows the damage cuts do to local communities, local economies and the fabric of our society. They are the result of decisions and choices made at every level of Government; local, Scottish and UK. There is a better way because we can afford public services. Cuts are neither necessary nor inevitable and Scotland could have the properly funded and accountable public services our society needs. Increasing access for everyone to good quality food to improve Scotland’s diet and food culture is the right objective. Tackling food poverty and strengthening food safety must be as big a priority as the commercial benefits to the food and drink industry. •Realising the economic benefits of a better domestic food culture for Scotland’s food and drink sector. Scotland has one of the poorest diet-related health records in the world with obesity alone set to cost between £3bn and £5bn by 2030. Consumption of fruit and vegetables among the poorest 20% of Scots has fallen by a fifth since the recession and the subsequent welfare cuts kicked in. One third of cancers are diet related. So Food Nation is rightly about more than a new marketing strategy. In this context, it is at questionable if the initiative should come under the farming rather than the public health minister. The discussion document broadly reflects the ideas promoted in UNISON Scotland's 'Food for Good' charter. We first launched this in 2008 and updated it last year, so government recognition is welcome. We particularly agree that the public sector must lead by example, not only through public service catering, but also through procurement. However, financial pressures on school and hospital kitchens are making it very difficult to maintain standards. UNISON surveyed members working in catering and found that 54% say there have been major or severe cuts in the last 3-4 years. FoI requests showed that less than half of food is bought locally and off site cook chill catering is on the increase to cut costs. The discussion document emphasises how well Scottish food and drink brands are doing worldwide, although whisky remains the dominant export. What the document doesn't recognise is the importance of strong regulation and food safety. It takes only one food scandal to wreck a brand and shortcuts here make no sense. For example, the Scottish Government has only recently pushed new regulations through parliament that will allow meat producers to mince thousands of pig tumours and abscesses into our pies and sausages. It's a bad food nation that puts production speed and profit before safety and quality. So, let's welcome this initiative, while recognising that we have a lot more to do before we can claim to actually be a good food nation. If you want to chase the public pound in Scotland, you need to adopt our values. That means paying your taxes, respecting our environment and treating your workforce fairly. Today, I was speaking at a meeting on procurement at UNISON's annual conference in Brighton. Many outside and even inside Scotland see us as a public service monolith - if only! True, we do have a slightly larger public sector workforce and certainly limited marketisation of public services. However, nearly a third Scottish Budget (£10bn) is spent in the private or voluntary sector. So procurement and how we manage it, is important to UNISON members and the wider community. Ensuring that we don't just buy things, but that we extract maximum community benefit from the public pound. Procurement law is devolved to Scotland, but we are still in EU (for now!) whose Directives govern much of the process around procurement. The Scottish Government decided to legislate on this issue through the Procurement Reform Bill. This was intended as a largely business friendly technical Bill, reforming the procurement process. In fact, it was largely cosmetic, as many of the reforms could have been implemented through existing secondary legislation powers. Blacklisting. Stopping companies involved in the persecution of union activists from getting public contracts unless they make restitution to those affected. Tax dodging. Introducing an anti-avoidance rule, stronger than in UK legislation. People centred procurement. Using new EU exemptions and thresholds to exempt health and care and allow evaluation of employment standards. Tackling issues like zero hours contracts. Scottish Living Wage. This is already applied in the public sector and through procurement we can spread the benefits to our members in the community sector and the wider economy. We would have liked a mandatory requirement, but at least we now have legal procedure to allow public bodies to contract on that basis. No more dodgy legal excuses. Public bodies can now include the living wage in their procurement policy, evaluate bids against that policy and confirm in the contract. This will then become an enforceable performance clause. Greater emphasis on cutting carbon emissions, environmental standards and promoting fair trade. There is more work to be done on statutory guidance to firm up on the outline in this primary legislation. In addition, we have to implement the new EU directive in Scottish legislation. EU procurement rules are all too often used as a straightjacket or excuse for inaction. As a lawyer who has worked inside government, I am always telling ministers and councillors that they ask the wrong legal questions. Don't ask what is the legal position, but rather how can I achieve my policy objective with the least risk. The importance of the new legal framework for procurement in Scotland is the message it sends to bidders. If you want the public pound in Scotland you have to pay your taxes, respect our environment and treat your workers fairly. Law and frameworks are important, but it only creates an opportunity to do better. We have to organise to make the most of that opportunity. That means developing the procurement expertise of staff and activists, lobby locally, support branches and challenge poor practice at every stage of process. If we do that, we can use procurement to deliver important benefits for our members and the wider community. The human resource challenges facing Scotland's public sector are substantial, but a national workforce strategy could help transform public services in difficult times. I was speaking at the annual Scottish Human Resources Conference in Edinburgh today on the challenges in creating an healthy workforce environment. I have a lot of slides on the challenges, but also offered a few solutions as well! The long term shift from wages to profits is the main explanation for low staff morale, exacerbated by public sector pay cuts that have resulted in a £1600 a year cut in real wages since 2010. Next up is 50,000 public sector job cuts in Scotland since the crash with most of those in local government. That is also leaving an ageing workforce with a growing proportion of staff in their 50s and the number of young workers as a proportion of the workforce falling by 25%. The impact of austerity economics is not simply the financial cuts, although a 9% real term cut in the Scottish Government budget is very challenging. The problem is that the cuts come at a time of increasing service demand caused by the recession and demographic change. 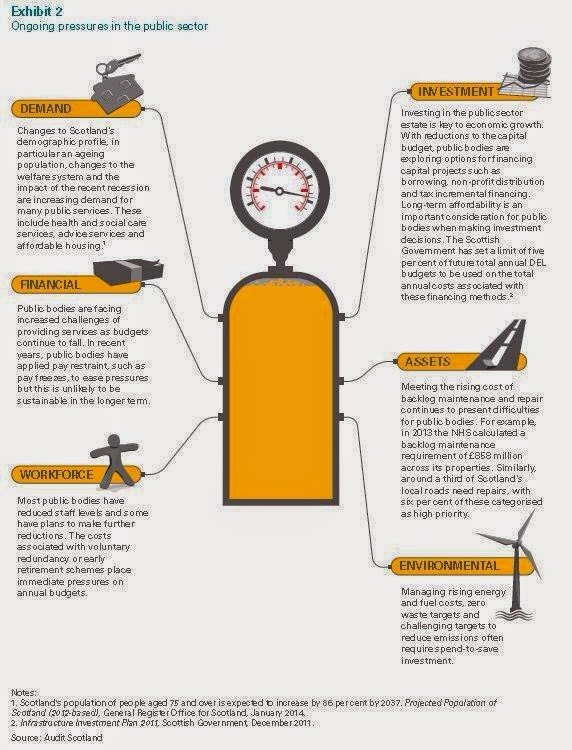 Add to that the shift from capital to revenue spending and long term asset replacement costs, it all adds up to multiple overall pressures on public services. The remaining workforce is expected to cope through salami slicing of services, while big and difficult spending decisions are avoided. There has been an reduction in overall employment standards with the use of zero or nominal hours contracts, weak health and safety, growing workplace stress and violence. Increasing work intensity is illustrated by the recent survey that found that only 17% of workers leave their workplace for break and 42% eat at their desks. 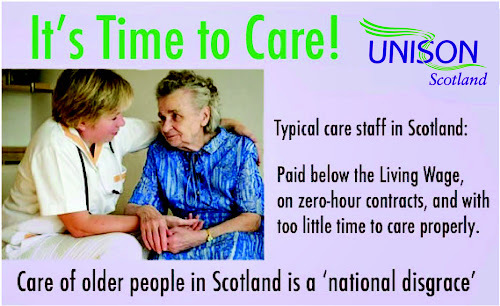 I illustrated some of these issues using UNISON's 'Time to Care' report into social care. The race to the bottom in this sector has resulted in low pay, zero hours contracts, minimal training and just not enough time to care properly. I also challenged the obsession with chasing sickness absence management on the back of dubious statistical comparisons with the private sector. Given these challenges, it is hardly surprising that staff surveys show the public sector struggling behind the rest of the economy. The latest CIPD Survey showed that only a third of workers feel engaged. While generally positive about their line managers, senior manager trust and respect has fallen by 11%. Only a third believe their performance management systems are fair and 41% report excessive pressure at work weekly. These findings are replicated in UNISON surveys of occupational groups. These show a broadly negative view of future service cuts that put service standards at risk. Staff are being asked to cut corners, abandoning proactive preventative work in favour of reactive short term approaches. The Christie Commission report was published three years ago this month. While there has been some progress, it's workforce vision has yet to be realised. Too many government reform initiatives largely ignore the staffing implications. Public services are delivered by people, not robots. The Christie vision of a joined up workforce needs a national workforce strategy that stops us wasting effort reinventing the wheel on issues like staff transfer, pensions, secondment and common procedures. A staff governance framework across the public services that engages staff at all levels is an urgent priority. There are some positive initiatives, but they are disconnected and health and care integration in particular will be a huge challenge. A national strategy should be a framework, not a top down prescription, to enable the bottom up service design envisaged by Christie. The joined up one public service worker approach recommended in that report won't happen without it. Protecting the consumer and quality Scottish food brands needs proper regulation and a new Food body that puts food safety before company profit. I was giving evidence this morning to the Scottish Parliament Health Committee on the Food (Scotland) Bill. This Bill creates Food Standards Scotland to take over the work of the UK-wide Food Standards Agency in Scotland, and establishes new food law provisions. UNISON welcomes the devolution of this work from a UK body that has a mixed record in protecting consumers. It has all too often fallen into the deregulation lobby and tamely surrendered to the pressures from some meat producers for faster production at the expense of food safety. We hope that a Scottish body will recognise that protecting the brand requires independent inspection, so that the consumer can have confidence in the product. It was encouraging to hear Tesco making similar points this morning. A key test will be to ensure that meat inspection is not handed over to the companies as many of the producers would wish. A company meat inspector is inevitably placed in an impossible conflict of interests position. There is a good example of deregulation currently in front of MSPs with an EU proposal to introduce visual only inspection of pig carcasses. This means the 37,000 abscesses and tumours spotted by meat inspectors are likely to be missed in future and minced into our sausages and pies. The health risks may be low, but this is a quality issue. Something the FSA thinks is nothing to do with them. I trust MSPs grasped what the FSA said on that point this morning and ensure that quality is a concern. There is a welcome strengthening of the regulatory powers in areas such as administrative fines and a duty to report. However, all the legislation and regulation in the world is useless if it is not enforced - a common theme in evidence this morning. The numbers of local authority Environmental Health Officers and staff dealing with food have been cut by 20% and food sampling is down by a third. Putting an out of date inspection report on a restaurant door is pointless. The preventative and education work that the industry welcomes is also being reduced because of staffing cuts. The legislation is very light on staffing issues, you would think inspection was carried out by robots! Staff transfers are relegated to the Financial Memorandum when the Cabinet Office rules say they should be in the legislation. There are also no provisions for Staff Governance, something the new body would benefit from. There may well be a reduced demand for pies and and sausages in the MSP canteen today and our latest info graphic makes the point visually. Let's hope our MSPs recognise that food safety and quality is everyone's business. The latest report from Audit Scotland highlights the significant financial challenges faced by Scotland’s public sector. The Scottish budget has fallen 9%, in real terms, from £31.9bn in 2009/10 to £28.9bn in 2014/15 and is expected to reduce further. Audit Scotland believes public bodies have coped well so far, but face increasingly difficult choices in reducing spending while maintaining service standards and meeting rising demand. There is limited evidence of longer-term financial planning. Plans generally focus on the short to medium term up to five years. 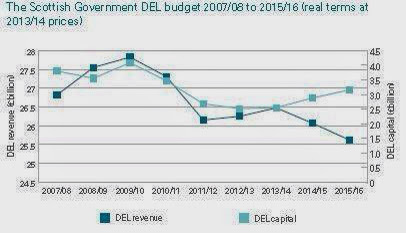 The two main components of the budget, revenue and capital, show different trends since 2009/10: The revenue budget has fallen by £1.8 billion (6%) to £26 billion in 2014/15. The capital budget has fallen by £1.2 billion (29%) to £2.9 billion in 2014/15. Although the overall trend shows a decline, this budget has increased by 15% since 2012/13 in line with the Scottish Government’s policy to increase capital investment. This chart illustrates the shift from revenue to capital. The Scottish Government also has a substantial PPP programme, not something they are keen to highlight. As UNISON has repeatedly pointed out, these projects create longer-term financial commitments and to reduce flexibility in how future revenue budgets can be used. This report notes that since 2010, contracts for projects with a value of around £1.7 billion have been agreed using revenue-financed methods with a further £1.7 billion planned for future years. The much vaunted ‘ring fencing’ of health spending has never quite lived up to the headline, largely due to above inflation costs in this sector. By 2015/16 even this protection goes, with the health budget reducing by £73 million (1%). Area health board budgets are increasing by 1%, while special health boards are cut by 1% and central spending is cut by 3%. Local government has taken the brunt of the cuts in Scotland since the crash. The Scottish Government provides over 80% of the funding for local government. The rest comes from council tax and charges. The Scottish Government’s budget for local government will decrease by £200 million from £7.7 billion to £7.5 billion, a cut of 3%. The pressures on public bodies are not simply financial. 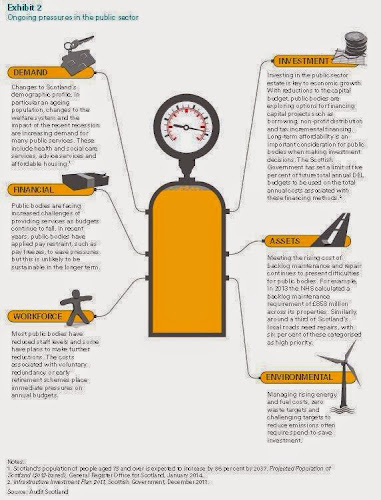 This info graphic illustrates the ongoing pressures very well. The second part of the report makes recommendations as to how public bodies might mitigate the pressures. More data, focusing budgeting on priorities, a long term approach to financial planning and greater scrutiny are all very worthwhile. However, they are at best a sticking plaster on a pressure cooker, and that never ends well. Despite the Secretary of State's spin, the Queen's speech was light on legislative proposals for Scotland, or the UK for that matter. I am always impressed with the Queen's ability to keep a straight face through these speeches. Particularly this nonsense, "My government’s legislative programme will continue to deliver on its long-term plan to build a stronger economy and a fairer society." PensionsPension changes are the main headline for Scotland. People at 55 or over with defined contribution pensions will be able to withdraw their savings as they wish, subject to marginal rates of income tax and scheme rules. No-one will be required to buy a guaranteed lifetime annuity with their pension pot. This doesn’t apply to most public sector pensions, which are defined benefit schemes, although they also intend to bring forward legislation to ban transfers out of unfunded public sector schemes such as the Scottish NHS scheme, but apparently not the LGPS. New "defined ambition" collective pension schemes will be launched as an alternative to other existing options. This would allow groups of people to pay into the same scheme and share the risk. This approach has delivered lower costs in the Netherlands. Again, it doesn’t apply to public sector pensions. In addition, there is an obvious contradiction between the two pension proposals. As Craig Berry explains, the success of collective pensions depends on the very restrictions that Osborne’s plan outlaws. It is also inconceivable that collective pensions can be delivered before the General Election. A new tax-free childcare subsidy worth up to £2,000 a year per child will be introduced in the autumn of 2015. All parents with children under the age of 12 will be eligible, if they are in paid work and earn less than £150,000 a year. For every £8 paid by parents towards the cost of childcare, the state will provide a £2 top-up. The existing employer-supported childcare scheme will be repealed. Nothing of course about the quality of childcare provision. Voters will be able to trigger a by-election where an MP has committed serious wrongdoing and 10% of their constituents have signed a petition over an eight-week period. The "recall" process would be triggered if an MP is convicted of an offence and receives a custodial sentence of less than 12 months and when the Commons agrees to such a process. This is a watered down version because parliament will have an effective veto. Mostly an English Bill, but there are proposals to allow developers to run shale gas pipelines under people's land without their permission. There is a complex interplay of reserved and devolved issues with this proposal that is anyway subject to further public consultation and with the Scottish Government. Scottish Water is a public corporation that delivers a publicly owned water and sewerage service to the people of Scotland, unlike the privatised service in the rest of the UK. It's a model that has served Scotland well, delivering clean fresh Scottish water to homes and businesses and removing sewage along some 60,000 miles of pipes. Despite our challenging geography the average Scottish water bill is lower than the average bill in England and Wales. Scottish Water has delivered a massive capital programme to update our aging infrastructure. It spends just under £500m a year on infrastructure including pipes and treatment works, funded largely by the water charge payer with borrowing support from the Scottish Government. While Scottish Water is a public service there has been an incremental drift towards privatisation. Firstly, through hugely expensive PFI schemes that even the pro-privatisation Water Industry Commission (WIC) has criticised as being poor value for money. This has been followed by a broader PPP scheme, Scottish Water Solutions and the extensive contractorisation of Scottish Water. The insider web site ‘Utilities Scotland’ has submitted FoI requests to ascertain the extent of privatisation in the delivery of the capital programme. The table below sets out the capital programme for each of the last five years and the proportion by value that is delivered by Scottish Water and external contractors. This table shows that in the last four years for which figures are available, 92.5% of Scottish Water’s capital programme has been delivered by private contractors, 7.5% by Scottish Water staff. By any standard that is substantial privatisation. Scottish Water likes to claim that over 85% of Scottish Water’s supplier spend is with organisations who have locations in Scotland. They also say that the delivery of the capital expenditure has involved a total of 135 framework contractors – 106 being Scottish based and 29 being UK based, “helping to support jobs in the Scottish economy”. Utilities Scotland sought to test this claim by asking Scottish Water to break down the amounts spent into companies headquartered in Scotland, rest of the UK or outwith the UK. This is important because ‘locations’ doesn’t necessarily mean Scottish companies or even Scottish jobs. It could simply mean a depot for a particular project. The number of ‘framework contractors’ is also fairly meaningless without knowing the value of the contracts. Lots of small value local contracts, or extensive sub-contracting could skew the significance of this statistic. It hasn’t been possible to test these claims of Scottish jobs because Scottish Water says they do not hold the information on headquarters, they only record whether contractors have a Scottish or UK base. Scottish Water has benefitted from a fairly stable political environment for a number of years. The SNP, Scottish Labour and the Greens have supported public ownership with only the Conservatives and Liberal Democrats making the case for privatisation. However, it is perhaps surprising that the White Paper ‘Scotland’s Future’, has no mention of a commitment to a public water service should Scotland vote for independence in September. Given current SNP policy, it would be helpful if the Scottish Government gave some reassurance that this is simply an omission. The reaction of the European Commission to the citizen’s initiative, ‘Right to Water’, falls short of what 1.9 million people across Europe asked for. In particular, there is no proposal for legislation recognising the human right to water. The Commission has also not committed to explicitly exclude these services from the trade negotiations such as the Transatlantic Trade and Investment Partnership (TTIP) in their Communication. This could also have implications for Scotland’s public service model. Scottish Water is a public sector success story, but we are only too aware that there is a powerful lobby for privatisation. The gradual drip of privatisation has reached epic proportions in these disclosures about the capital programme. 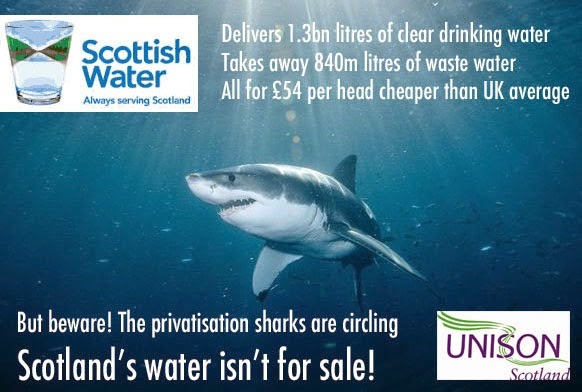 The privatisation sharks are still circling Scottish Water and Scotland needs to remain vigilant.